Today we want to tell you about another super yummy and healthy item you definitely must have on your food list! The Avocado! But first things first: Did you now…the avocado is a fruit and not a vegetable! Who would have imagined that, right? And it sure isn’t one of the prettier ones. Sometimes they’re called alligator pears because of their shape and their greenish brown skin with its rough outer texture. The Hass avocado, grown in California, has the alligator skin. The shiny ones come from Florida. But no matter how they look like they’re all delicious and they’re all so good for you. The largest avocado available in stores is the “Avozilla” which is grown in South Africa. They typically weigh about 3 pounds each. And the skin is so thick that once you get the pit and the flesh out, you can use the skin as a serving bowl! That’s a good and fast way to clean the kitchen – once the serving bowl is empty, just toss it! The largest avocado ever grown is on record as being 4.8 pounds. Wow! Holy guacamole! That’s a whole lot of avocado, right? Avocados were originally from Central and South America and have been grown there since 8,000 B.C. They were introduced to Jamaica in the mid-17th century and then spread through the Asian tropical regions one hundred years later. In the early 20th century they began growing them in California and Florida. Now most tropical and subtropical countries grow them. People used to think that avocados were “bad” because they’re high on fat. Well, it is true that they’re almost 85% fat, but that 85% is actually very healthy. Research has proven it. The avocado fat offers unique health benefits just like walnuts and flaxseeds do. It’s also pretty low on carbohydrates and sugar. One cup of avocado provides 7-8 grams of dietary fiber. Avocados don’t have any sodium or cholesterol and they help regulating your blood sugar. 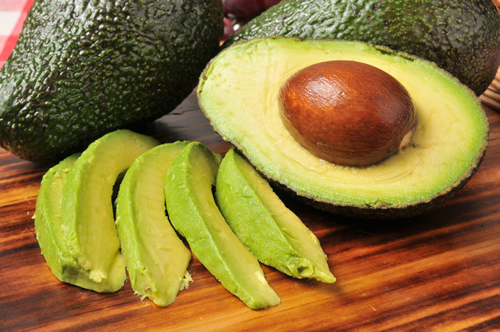 One-fifth of a medium sized avocado has almost 20 vitamins and minerals! Really? Really! It also makes a great food for babies, because it’s so creamy and smooth. They are loved by vegetarians and vegans, too! Avocados are part of the Super Food Family … and if you ask me I think the avocado deserves a cape and a super hero suit! To figure out if your avocado is ripe or not, give it a light squeeze. A ripe one will be slightly soft but won’t have any cracks or dark sunken spots. If you buy ones that are firmer, they’ll ripen once you get them home. You can put them in a fruit bowl or leave them on the counter or put them in a paper bag. In a few days they should be perfect. But please don’t put them in the refrigerator until they’re ripe. And if you’ve already opened one and haven’t used it all, put it in a plastic bag and sprinkle some lemon on it to keep it from turning black. It’s the oxygen in the air that turns them black. Put away your vegetable peeler. It won’t work. Use a small knife and cut the avocado in half lengthwise. Then you twist the two halves in opposite direction to separate them. To safely remove the pit, scoop it out with a spoon. Ideally, you want to gently remove the flesh from the skin by peeling the skin back with your fingers. But you can also use the spoon for this by just slighting it around, between the flesh and the skin, until all of the flesh is loose. The best and healthiest part of the flesh is just underneath the skin; so don’t forget about that part. Of course you know by now that people are using avocados in just about everything. They use them in cupcakes and wraps and smoothies and on top of eggs and mixed in egg salad, chicken salad, and with enchiladas. They’re even used in chocolate chip cookies and banana bread. It’s up to you and your imagination. But the NUMBER ONE item is guacamole. Oh, yums! 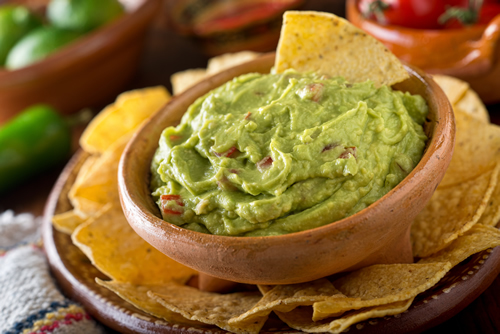 On football’s Super Bowl Sunday Americans consume over 8 million pounds of avocados. WOW! You can add tomatoes and onions and hot sauce and use tortilla chips or potato chips to scoop it out. For Cinco de Mayo Americans eat about 14 million pounds of avocados. Double WOW! Kids, if you ever wondered why your mom is running around the house with a green mask on her face, here is why…You can use avocados to moisturize your face and body. Just slather it on, let it sit for about twenty minutes, and then rinse off and pat dry. You’ll glow! You can use a combination of avocados and honey and yogurt to get rid of the dry skin on your face. You can combine it with olive oil and eggs and let it sit on your hair until you rinse it out. Your hair should shine. And if you have sunburn, plop some avocado right on the red spots for some relief. Now, isn’t that astounding? And don’t forget that avocados can offer you a great start to the day. 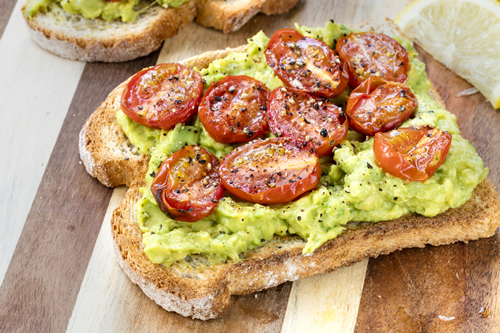 Something as simple as a mashed avocado on whole-wheat bread (or cracker) with tomatoes and a teeny bit of lemon should get everyone going. You can add an egg on the side or whatever you’d like. Can it be sloppy to eat? Absolutely! That’s the fun part? Note: While few people are allergic to avocados, it does affect those with tree-pollen allergies and latex allergies. Avocado leaves, bark, skin, or pit are documented to be harmful to animals; cats, dogs, cattle, goats, rabbits, rats, guinea pigs, birds, fish, and horses can be severely harmed or even killed when they consume them. 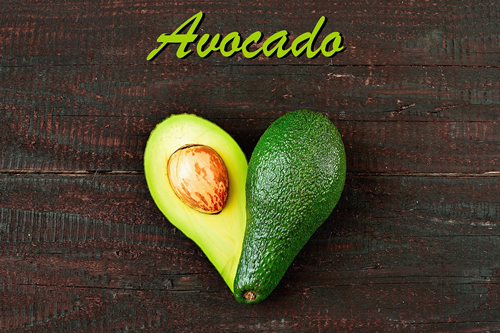 The avocado fruit is poisonous to some birds, and the American Society for the Prevention of Cruelty to Animals (ASPCA) lists it as toxic to many animals including cats, dogs, and horses. So kids, please don’t feed avocados to your pets! Just because it’s good for you doesn’t mean it is good for them. How do YOU eat avocados? Do you know of any yummy recipes?